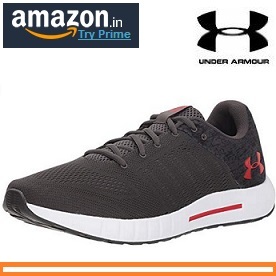 Buy Under Armour Shoes at awesome discount on Amazon India. Under Armour Mens Shoes Offer can be redeemed at Amazon.in. Also users can get Rs.300 cashback by redeeming Amazon Pay Balance Cashback Offer. Name : Under Armour Men’s Ua Micro G Pursuit Fiber Opt Running Shoes. Shoes are synthetic sport shoes with lace -up closure. Offer is available in Size 7 UK only. Pay using Amazon Pay balance. 1. Load balance now: Get Rs.300 back instantly. Load Amazon Pay balance of minimum Rs.3000 or more and get Rs.300 back per customer. Offer valid from 28th Sep to 8th Oct 2018. 3. Go Cashless: Get 10% cashback up to Rs. 50 using BHIM UPI or RuPay cards. Offer period October 1st to October 13th. Cashback will be credited as Amazon Pay balance within 15 calendar days from purchase. 4. Go Cashless: Get 50% cashback up to Rs. 100 on your first online payment. Pay using ATM card or credit card. Offer period 1st October to 13th October. Users will get cash back credit within 15 days from purchase. Under Armour, established in 1996, is an American company that manufactures footwear, sports, and casual apparel. It was founded by former University of Maryland football player Kevin Plank. The company relentlessly works to make best athletic gear. So enjoy the Under Armour Mens Shoes Offer.